The EastDell Estate Winery is located in the heart of the Peninsula and offers guests a chance to experience more than a wonderful winery in the Niagara Region. Guests are encouraged to take advantage of the natural picturesque setting of the winery and venture along the 5 km path connected to the vineyard. 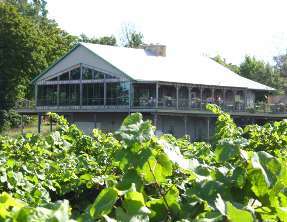 The EastDell Winery is located on Niagara’s West Wine Route atop the Beamsville Bench, one of Canada’s premier viticulture districts. Located in the heart of the Niagara Escarpment, EastDell Estates winery strives to preserve the natural beauty of the surroundings while producing premium wines. The property stretches across 110 acres, with the vineyard being 85 acres. The vineyard grows only the classic grapes of the area, including Cabernet Sauvignon, Cabernet Franc, Merlot, Chardonnay, Riesling, Vidal, Pinot Gris, and Pinot Noir. The VIEW Restaurant adapts to the natural surroundings by only offering seasonal cuisine, paired with EstDell Estates Wines. This mystery vineyard 60 minute tour takes guests on a tour and tasting and then lunch, dinner or Sunday Brunch. A guided your with a tasting of three EastDell Wines. The 20 minute tour needs a 12 guest minimum. This tour is a hike through all the vineyards, hills and dells of the EastDell Estate. The 45 minute tour includes wine tasting and costs $5.00/person. This fun and educational tour is given by the wine experts of EastDell Estates. The 30 minute tour allows guests to enjoy a selection of wines and fresh breads. Cost is $6.00/Person. The perfect way to learn perfect wine pairings while in Niagara. The tour is 35-45 minutes long and costs $8.00/person. This one of a kind package allows guests to enjoy the three properties in the area with a stop for lunch, dinner or Sunday Brunch at The VIEW Restaurant.